At present, we treat nations as though they were persons: We punish entire nations by sanctions, even when only the leaders are guilty, even though the burdens of the sanctions fall most heavily on the poorest and least guilty of the citizens, and even though sanctions often have the effect of uniting the citizens of a country behind the guilty leaders. Should we not regard sanctions as collective punishment? If we do so, then sanctions are a war crime, under the Fourth Geneva Convention. Much can be criticized in the way that the Gulf War of 1990-1991 was carried out. Besides military targets, the US and its allies bombed electrical generation facilities with the aim of creating postwar leverage over Iraq. The electrical generating plants would have to be rebuilt with the help of foreign technical assistance, and this help could be traded for postwar compliance. In the meantime, hospitals and water-purification plants were without electricity. In addition, during the Gulf War, a large number of projectiles made of depleted uranium were fired by allied planes and tanks. The result was a sharp increase in cancer in Iraq. Finally, both Shiites and Kurds were encouraged by the Allies to rebel against Saddam Hussein’s government, but were later abandoned by the allies and slaughtered by Saddam. The most terrible misuse of power, however, was the US and UK insistence the sanctions against Iraq should remain in place after the end of the Gulf War. These two countries used their veto power in the Security Council to prevent the removal of the sanctions. Their motive seems to have been the hope that the economic and psychological impact would provoke the Iraqi people to revolt against Saddam. However, that brutal dictator remained firmly in place, supported by universal fear of his police and by massive propaganda. The effect of the sanctions was to produce more than half a million deaths of children under five years of age, as is documented by UNICEF data. The total number of deaths that the sanctions produced among Iraqi civilians probably exceeded a million, if older children and adults are included. Deaths of children under five years of age in Iraq, measured in thousands. 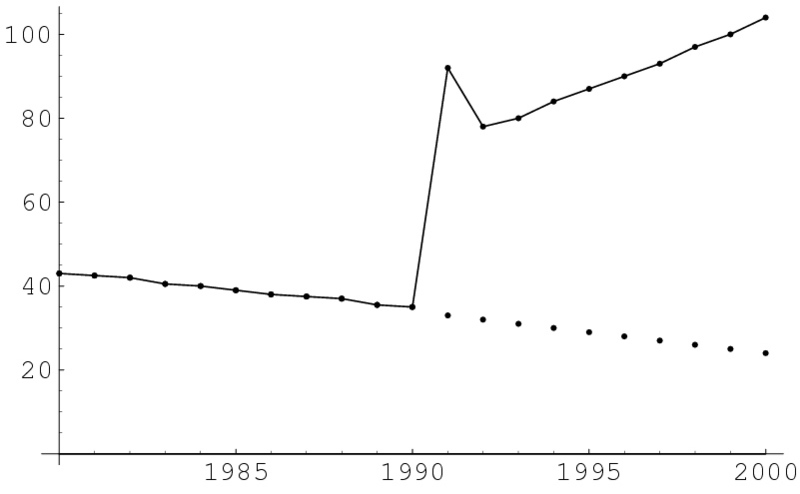 This graph is based on a study by UNICEF and shows the effect of sanctions on child mortality. From UNICEF’s figures, it can be seen that the sanctions imposed on Iraq caused the deaths of more than half a million children. In addition to the fact that sanctions are a form of collective punishment, and thus a war crime under the Fourth Geneva Convention, we should also remember that Iran is completely within its rights under international law and under the NPT. The NPT was designed to prevent the spread of nuclear weapons beyond the five nations that already had them; to provide assurance that “peaceful” nuclear activities of non-nuclear-weapon states would not be used to produce such weapons; to promote peaceful use of nuclear energy to the greatest extent consistent with non-proliferation of nuclear weapons; and finally, to ensure that definite steps towards complete nuclear disarmament would be taken by all states, as well steps towards comprehensive control of conventional armaments (Article VI). Several nuclear weapon states, notably the United States, are grossly violating Article VI. The NPT has now been signed by 187 countries and has been in force as international law since 1970. However, Israel, India, Pakistan, and Cuba have refused to sign, and North Korea, after signing the treaty, withdrew from it in 1993. According to Wikipedia, Israel’s first Prime Minister, David Ben-Gurion was “nearly obsessed with obtaining nuclear weapons”, and under his administration, work on obtaining these weapons for Israel was started in 1949. “Iranian government officials want to know how the Trump administration can get away with punishing Iran and other countries for complying with the internationally recognized nuclear deal signed in 2015. “This is the second round of sanctions since Trump pulled out of the Iran nuclear deal, a deal that was signed in 2015 not only by the US and Iran, but also by Germany, England, France, Russia and China – and approved unanimously by the UN Security Council. It’s also a deal that has been working. Iran has been complying with the most intrusive inspections regime ever devised, as the International Atomic Energy Agency has confirmed 13 times. The sanctions are already taking a tragic toll on the innocent people of Iran, undermining both their health and their economic security. Surely, this must be seen as an example of collective punishment. This article originally appeared on Transcend Media Service (TMS) on 19 Nov 2018. Anticopyright: Editorials and articles originated on TMS may be freely reprinted, disseminated, translated and used as background material, provided an acknowledgement and link to the source, TMS: Sanctions as Collective Punishment, is included. Thank you.